Not much information is available. It was built by the York sculptor and monumental mason Job Cole, and donated to the city by Henry Cowling, a local solicitor. It’s a rather grand and fancy structure, the product of a very different age, when drinking from a communal spout or cup seemed acceptable. While writing this page I’ve had a vague memory resurface of once drinking from a street fountain, sometime in childhood or adolescence. Might have been this one. I didn’t investigate whether it’s still possible to drink from it, but doubt it is. 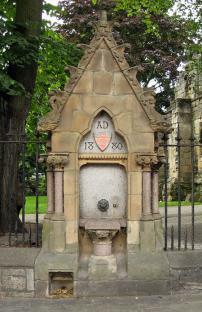 The provision of clean drinking water was valued so much more in the 19th century, and the provision of the first public drinking fountain in London such a notable event that crowds turned out for its official unveiling. 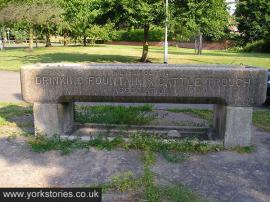 A charitable organisation, The Metropolitan Drinking Fountain and Cattle Trough Association, was established in 1859. The cattle trough element wasn’t originally part of its role, and perhaps came with greater awareness of animal welfare. The association provided this trough, in Acomb, near the village green. Again, it’s difficult to find further information. I don’t know when this trough dates from. As discussed during an earlier wander through Acomb, it was familiar to me from my childhood, but I’m not old enough to remember it in use. I have never seen a cow in Acomb. 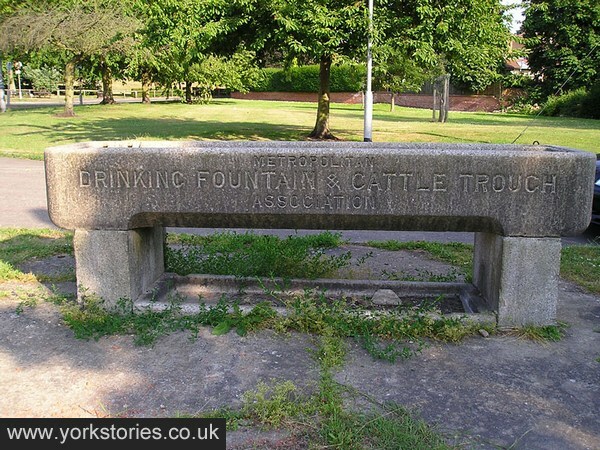 There are other cattle troughs bearing inscriptions, on the outskirts of the city and in its suburbs: on Clifton Green, on Lawrence Street, and on Bishopgate Street. There are possibly other surviving drinking fountains, or ones remembered. Your comments welcome.